Expressiveness, intensity and profundity in the most acidic noble botrytis. This wine is made from grapes in the La Clota plot in Mas Fonoll, where we grow Chardonnay. A lively gold color. Intense flavor of apricot pulp, orange marmalede, mango and gingerbread. A rich and unctuous texture that offers full notes of tropical fruit and peach and, too, smoky notes and notes of dried flowers. Very dense and full of taste going right to your palat, feeling deep and remaining there really long due to its outstanding acidity. 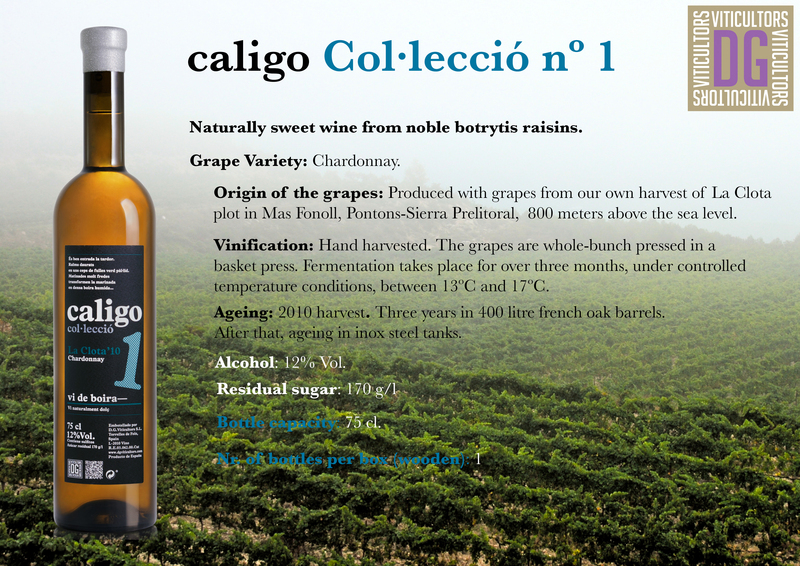 Naturally sweet wine from grapes afflicted by noble botrytis and allowed to overripe raisinlike. The Gewürztraminer grapes from the Roure plot, one of the last plots to be affected by noble botrytis, in the exceptional vintage for botrytis wines that was 2010, make this collection unique in elegance and intensity. Grapes from the plot El Roure (the Oak), where we grew Gewürztraminer variety, together with the Loureiro plot located in Mas Sapera. Hand harvested. Gewürztraminer raisinlike grapes afflicted by botrytis and then infused for a whole day in Loureiro grapes must from the same harvest until they reach a similar density to that of our other noble botrytis musts. Directly and very fast pressing using the vertical press. Mellow golden color. Unctuous texture, with scents of tropical fruit and flowers. Dense, deep and elegantly long. Naturally sweet wine made of grapes afflicted by noble botrytis and allowed to mature in the vine like raisins up to their upmost. We relied on plots located in Mas Fonoll, in what we call the Camp Gran (the Large Field). The variety used for this wine is Sauvignon Blanc, that perfectly lends itself to mature like a raisin to the maximum. Hand harvested and direct pressing in the vertical press. Fermentation takes place under controlled temperature of 13C to 18C, during a period of more than 6 months. Afterwards we let it age inside 400 l. french oak casks for about 4 years before bottling. Bright gold. Tremendously aromatic to the nose with notes of mulled figs, ripe peach, orange peel and spices. Deep, juicy and extremely sweet but lively, offering an array of dense tastes of very sweet fruit enhanced by a juicy, citrusy character. The endtaste is long with a remarcable permanence that echoes peach and candied apricot.